Like fitness & SEO, nutrition is full of lots of contradictory and over-aggressive opinions. A lot of the differences in opinion occur because of the different backgrounds and sources of data that inform clinical and holistic nutrition. When I did my MSc at Chester University, in 2003, one of the lecturers, a doctor, was preaching to us about the fat-burning zone. Brilliant. A concept that went out in the 90s. One of the issues with clinical nutrition is that a theory or concept has to be proven without doubt, in repeatable studies etc., before it can be advocated. Now, one of the main problems with this is funding for research. If you remember the no-make-up selfie campaign on Facebook that raised over 8 million pounds? That provided the funds for 9 studies, 9! It costs over 800k per study. 800k! Because of this huge cost, the likes of pharmaceutical companies end up ‘sponsoring’ studies. Take the Lucozade “33% longer” marketing campaign that was based on a university study. The university that did the study received over 100k to do it, and they just happened to find that Lucozade improved performance, by exactly 1/3. EXACTLY 1/3rd. Bit suss that. Moreover, they didn’t advocate the improved performance to any individual ingredient like the maltodextrin, no, it was the specific branded product. So, just to summarise what my point is. By the time there is enough research to back something ‘new’ in nutrition from a clinical point of view, it is already behind the times. Even when there are lots of studies ‘proving’ something, it’s always suspect due to the funding and corruption that’s going on behind the scenes. Clinical nutritionists for example, may still tell you that aspartame is fine. They’ll tell you to eat a high carb, low fat diet, and that saturated fat is bad for you. Maybe they’re right; all the different theories are confusing! But FYI research is emerging to suggest that it’s not saturated fat that’s the problem in western diets, it’s the inflammation caused by chemicals, too much omega 6 and sugar. It focuses on short term performance to the detriment of health and longer term goals. If your diet is poor, drinking whey protein after you train and guzzling creatine won’t help your mental fog and general malaise you may be feeling. Again, lots of studies are ‘sponsored’ by sports nutrition companies (the Lucozade study being the best example). 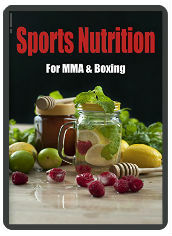 Mike Dolce is behind a bit of a change in the industry, and is advocating healthy nutrition as opposed to short-sighted sports nutrition. Long may it continue. Holistic nutrition focuses on a more ‘natural’ approach. Clinical nutrition is a bit like clinical medicine, it just focuses on short term symptoms etc. The problem with holistic nutrition is it isn’t as closely controlled and governed as clinical nutrition. You’ll get some greedy fly-by-night bellends trying to cash in on the lack of regulation. If you are confused about nutrition, I would recommend following the likes of Authority Nutrition on facebook, FoodMatters and MindBodyGreen. Self-education is always the best, and make up your own mind on things. Always look at the risk to benefit ratio of recommendations too. For example – if holistic nutritionists are recommending kombucha, and clinical nutritionists are saying it might kill you; then it’s probably best not to risk it (or at least do lots of research first).